I came across a really cool app the other day, called Sleep Cycle Alarm clock. How it works is, you place your phone on the corner of youe bed and while you are sleeping it tracks your body movements on the bed, using the accelerometer. You then set an alarm, and the app will wake you when you are in your least deep sleep, using a 30 minute cycle. So, if I set my alarm for 6:00 am, from 5:30 am, the app will continue monitoring my sleeping pattern, and wake me when I am in my lightest sleep, which means I wake up feeling refreshed, cause I was not in a deep sleep.It also displays a graph of your previous night’s sleeping pattern.This is one of mine from last week sometime. I saw this app a couple of days ago and was wondering if I should give it a try. Do you leave your phone charging then? Will it work without it plugged in? The battery should last the entire night if its not plugged in I guess. Sounds like an awesome app, I’m just concerned about frying my brain with cell phone radiation … all night long … ? @dRob, you’ve fried your balls all DAY long having your phone in your pocket. So it looks like we both dead from cellular radiation anyway! LOL.. Tried it for the first time lats night and it woke me up ok, but i still felt tired so hit “snooze” and went back to sleep and then later woke up feel tired :}} – Dont hit “snooze” Get up when it tells u too…. Been using this app since last Thursday and can honestly say that I’ve never had a better night’s sleep. I always wake up feeling great! Would gladly pay more for this app, $0.99 is a steal! I downloaded this after your review and I’ve used it for three nights sleep. I can also confirm that it works, in fact I had considered buying a physical alarm clock that does the same thing (I didn’t because you had to have wires attached to you!). So this is obviously MUCH better. My sleep pattern is not quite as “clean cut”, no predictable highs and lows, and I’m wondering if this is the effect of having two people in the bed both at different levels of sleep. Surely that muddies the graph a bit. That’s besides the point of course because even with two people in the bed it clearly works. I generally get up at 04:30, which is fine in summer, but even now the days are getting shorter and at 04:30 is is still mostly dark. 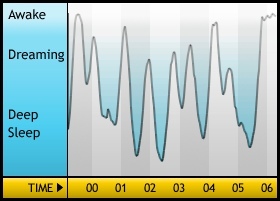 I had been finding it harder to wake up, but now after using Sleep Cycle I find it much easier to wake up at that time. I downloaded this app and have used it for the last 2 nights. Even with 2 people in bed it works very well. I will share my experience after a week or so for those who are interested in getting this app.